This second collection of meditations covers even more themes pertinent to the formation, life, and ministry of the ordained priest. 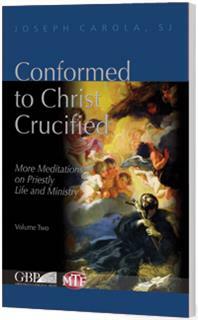 Like Volume One, each theme is one aspect of a common, unifying vision: priestly conformity to the Crucified Christ. Through the Sacrament of Holy Orders, the priest--in the depths of his being--is sacramentally conformed to Christ the Head. Truly, he can say with Saint Paul: “I have been crucified with Christ; it is no longer I who live, but Christ who lives in me” (Gal 2:20). This book calls both the seminarian who seeks ordination and the priest already ordained to embrace wholeheartedly the cruciform reality of the priestly vocation: to be made one with the risen Christ Crucified for God’s greater glory and the salvation of souls. Professor of Biblical Theology and the New Evangelization at the Franciscan University of Steubenville and visiting professor at the University of St. Mary of the Lake in Mundelein.